As mentioned in my post about conversion bits for Gaslands cars, ostensibly Hot Wheels and similar are 1:64 scale, also referred to as 20mm (meaning an in scale adult figure should measure 20mm from the ground to the eyes). However, this is very much a rough average since most of the vehicles are manufactured at a size that neatly fits the packaging with little regard for maintaining an accurate scale between vehicles (I have seen this referred to as “box scale”). In my experience the actual scale of cars alone varies from about 1:61 to 1:69. This may not sound like much but it is a significant difference, as it means a car that measures 4.5m long in real life could be anywhere from 6.5 to 7.3 cm long as a toy – a difference of 12%. And the variance gets worse the bigger or smaller the vehicle is in real life, since a large vehicle is compressed even more to fit into the packaging while a small one is increased in size (one Gaslander on Facebook mentioned experiencing scales of anything from 1:55 to 1:87). This means that Hot Wheels vehicles are simply not a good source of in-scale trucks to build war rigs or small buggies, for example. If you are interested in measuring the scale of your cars, perhaps because like me you want to build a Gaslands team which has consistency or near consistency in scale from vehicle to vehicle, you will first need to find an online source for the cars length. For most cars a simple Google search for [car name] length or [car name] specs will turn up a number of sources. In some cases a more involved bit of research will be needed, as in the case of the Ford Mustang Cobra racing car above, which neccesitated heading deep into the weeds of obscure Nascar fan sites. For European and Asian car manufacturers the length will tend to be given in mm, while for American cars it will tend to be in inches. Either measure your toy car in the same units, or do a Google search to convert the given length of the vehicle into whichever units you prefer to use, then divide the length of the real vehicle by the length of the toy vehicle to arrive at the scale. For example, a Mitsubishi Evo VIII I picked up has a length of 4,490mm in real life and measured in at 73.5mm in toy form. 4,490/73.5 = 61, so the scale in this case is 1:61 (far too big for my needs, which led to the metal body being discarded and the chassis and insides being cut down to make a buggy instead). Is Gaslands a 20mm game? The other way of measuring scale is the one typically used in the wargaming industry of measuring the height to the eyes of a typical figure. For example, Flames of War (WW2 wargaming) is a 15mm game. For Warhammer and Warhamme 40,000, Games Workshop have put out 28mm figures for most of their history but transitioned to something closer to 32mm in recent years. 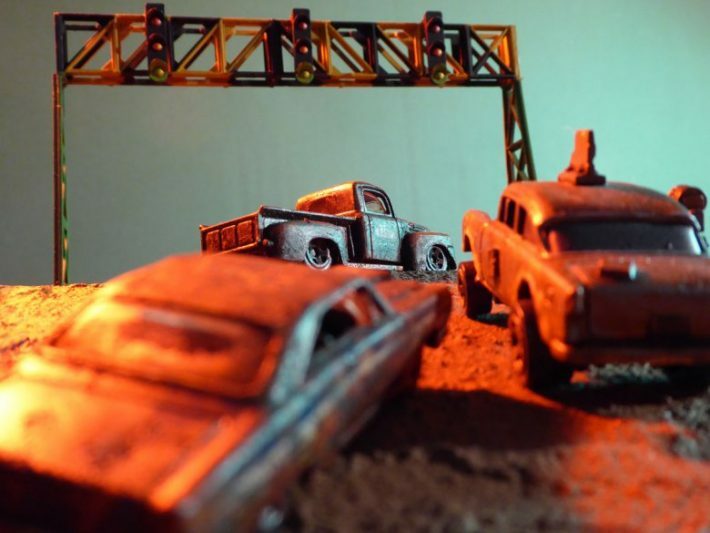 By this measure, Hot Wheels (and by extension Gaslands) are generally referred to as 20mm models. But is 1:64 scale equivalent to 20mm? Well, no… 1:64 is actually 25mm, while 20mm is actually 1:80.5. What’s going on? Well, it turns out that while 25mm is a traditional scale for historical (pre-20th century) wargaming, there are even less figures and parts available at this scale than there are for 20mm. Even historical wargaming has largely moved on to 15mm scale, and in any case who wants napoleonic era soldiers running around with their post apocalyptic cars? As a result, the Gaslands and Hot Wheels modding community has adopted the 20mm label, largely as a shorthand for saying “it’s 25mm but you won’t find any useful parts searching at that scale, so use 20mm instead“. One obvious point here is that 28mm, which is a legitimate scale that tends to have appropriate parts, is closer to 25mm. In fact, some Gaslands players prefer and recommend 28mm weaponry, which is why I’ve included sources of 28mm parts in my list of conversion bits. But one reason I think 20mm has caught on as the semi official scale of Gaslands instead of 28mm is that figures and small vehicles like bikes will be based, whereas vehicles tend not to be. The additional height imparted to a 20mm model by a 2-3mm base will make it look at first glance more in scale with a 25mm (1:64) scale car. On the other hand, adding additional height to a 28mm model only serves to draw attention to it’s already slightly oversized nature. And let’s not forget the ever unreliable scale of the cars themselves. If you find yourself in posession of a Gaslands team comprising vehicles that are much closer to 1:80.5 than 1:64, then 20mm becomes an even more relevant scale to work with. The reverse applies, of course, to any larger scaled cars (28mm scale is 1:57.5 – well within the range of what you may come across when buying toy cars). First post I read that makes sense and is readable about scaling models. Thanks!